Colliers Wood shares the SW19 postcode with Wimbledon. This up-and-coming area, one of south-west London’s best kept secrets, is currently undergoing an exciting period of transformation. With its mix of traditional and modern residential properties, it offers more for your money than its affluent neighbour. No wonder it’s rapidly becoming a go-to destination for families and young professionals alike. Take your pick from the Istanbul Meze Mangal for the tastiest delights of Turkish cooking, or keep the whole family happy at Corleone Pizza or if Japanese is more your thing then book a table at Rockstar Sushi Bar. You’ll find there’s a handy Nandos here too, as well as locally-owned Time Out award winner, Coffee in the Wood. Alternatively take a walk to Merton Abbey Mills for a variety of cuisines from Thai to Jamaican, all washed down with a pint from the Wimbledon Brewery. And before you come home, remember to pick up something from renowned delicatessen Cut and Cured. There’s a big beer garden and riverside terrace on the Wandle at the William Morris Pub. Equally appealing is the Charles Holden, with its fantastic outdoor space, and a kitchen and herb garden. It’s great for meeting up with visiting friends too because it’s right opposite the tube station. And if you plan to make a night of it, start out with a cocktail at Istanbul Meze, which also offers a shisha bar and serves non-alcoholic drinks. Colliers Wood takes its name from a forested area that stood to the east of the High Street until the mid-1890s. It’s home to a 12th Century ruin, Merton Priory, where in 1437 Henry VI became the only English king of the last millennium to be crowned outside Westminster Abbey. Also notable is Merton Abbey Mills, one of London’s oldest heritage sites, with a theatre dating back over 400 years. 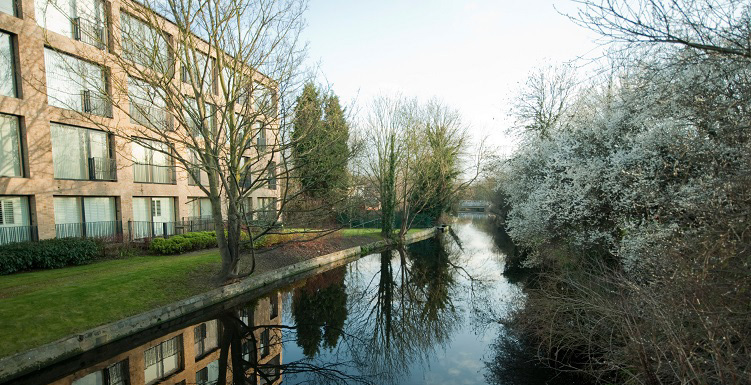 Its site on the River Wandle is of genuine ecological value — not least for its population of eels which are collected, counted and measured every week, with research findings reported to London Zoo. It’s also the home of London’s only working watermill — one of just four in the country — as well as a community of creative artists and award-winning food producers. Nearby Wimbledon is a hub for local events. Throughout the year the regular themed markets in the central piazza bring fine handicrafts and an array of alternative culinary delights. And for those with an appetite for something more cerebral, between September and November you can take your pick from the annual Merton Arts Trail, Wimbledon’s 10-day Bookfest, and a highly-respected International Music Festival. The town centre is also a prime vantage point for cheering on the scores of amateur cyclists who brave 100-mile Prudential RideLondon-Surrey charity fund-raiser every July. Colliers Wood community spirit is boosted by its annual Street Party and Autumn Fair which sees the local residents join together in song and dance. With two retail parks — the Tandem Centre and Priory Retail Park — there really is no need to shop further afield. Located a few minutes’ walk from the high street and with lots of free parking, they offer a wide range of stores including Currys, PC World, Mothercare, Next, Boots, Toys R Us, Argos, Holland & Barratt and TK Maxx. On top of that, come to Colliers Wood and you’ll find a large Sainsbury’s Savacentre plus one of London’s biggest Marks & Spencer stores, complete with fashion, food and furniture departments. Taking of furnishing, if you’ve just moved into a new place home improvements are a breeze here. Homebase and Wickes are both nearby on the Lombard Trading estate, while Colliers Wood High Street is the home of a huge selection of bathroom brands at Burge & Gunson. And next door to that there’s an amazing selection of floor and wall tiles, wood flooring and carpets at Style Interior. There are three parks in Colliers Wood: a recreation ground; the 45,000 sq metres of the National Trust-owned Wandle Park; and the more informal Wandle Meadow Nature Park. Colliers Wood Recreation Ground itself was nominated for a Green Flag Award — the mark of a well-maintained green space with excellent facilities. July 2010 saw the opening of the first Barclays Cycle Superhighway. This 8.5 mile CS7 bicycle lane links Colliers Wood to Southwark Bridge in the centre of London, with a pedalling time of around 45 minutes. Meanwhile, the lazier or crazier ones amongst us can count on the Northern Line tube — more so, now that it also runs for 24 hours at weekends. Rated outstanding by Ofsted, Willows pre-school and the expanding primary school, Singlegate, are top options for the youngest members of the family. And because you’re never too old to learn, Colliers Wood Community Centre is a hot spot for ‘Strictly&apos; fans, with classes in the waltz, quickstep, rumba, foxtrot, Argentinian tango and more, available to all. Ballet for adults is on offer too — courtesy of Royal Ballet-trained Bethany, who used to dance with the world famous Matthew Bourne company.